Kolkata's quintessential cafe hood has yet another beautiful cafe to woo you into it. Sitting just opposite Delices, Je T'aime has a quirky charm to it with its old art deco architecture, pop colour decor and yummy nibbles. 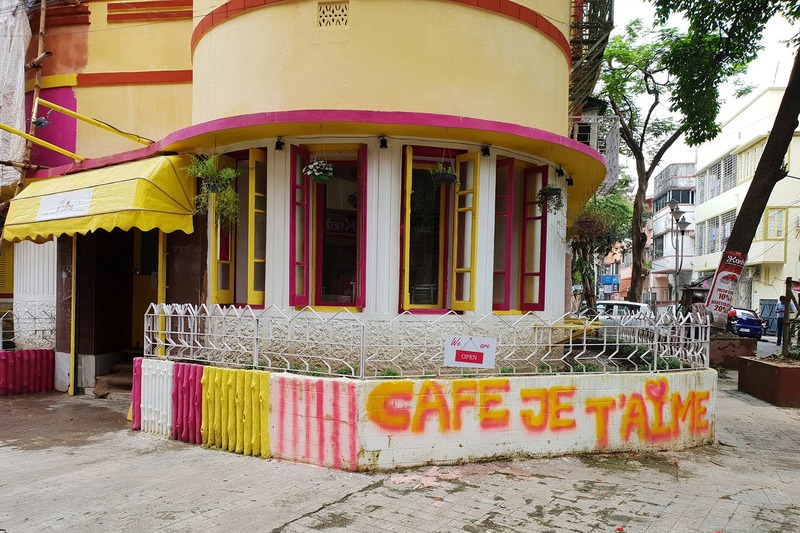 You can't miss this colourful cafe once you walk into Keyatala Road from Purna Das Road. The bright yellow awning and the spray-painted name against the cafe wall will pique your curiosity as much as its French name. Literally translating to 'I love you', this cafe claims to be themed on love and features cute little doodles (drawn by cafe co-owner Shakuntala) here and there that sings of love. An absolutely no-fail Instagrammable spot, the cafe's colourful interior with yellow and pink furniture, large louvre windows and kitschy decor make for a good vibe and chill mood. The nook by the large windows is ideal for some me-time over coffee and a book (which you can borrow from their shelves). Come with your gang and play a game of Scotland Yard (or Monopoly or other board games) while you nibble on their tidbits. Try their Twin Punch Mushroom or their mid-course meals like a veggie wrap that'll feed your hunger, but wont kill your appetite. With an open kitchen in the house, the smell makes it slightly stifling to sit in this closed space. With two guitars in house and space for an open mic, this cafe encourages new talent of different sorts. So, drop by here without hesitation and sign up for their open mic events. Very soon, they will regularise their stand-up comedy gig too.